Visiting the Loire Valley in France last year spoiled us with a bunch of breathtaking castles. It’s not so easy to knock us off our feet anymore. Nor we have expected it to happen in Eastern Europe as most of the castles there are rather fortresses or ruins of fortresses that are built to be not beautiful but strong in the first place. Well, we were wrong about this. Though the nobility in the Eastern European countries was not that incredibly rich as the nobility in France, Germany or England but they got by well enough to build some amazing castles. And even though Eastern Europe’s cultural heritage suffered serious damages in the World Wars and the following communistic nationalization, still a large amount of cultural treasures were preserved or restored. Like castles. 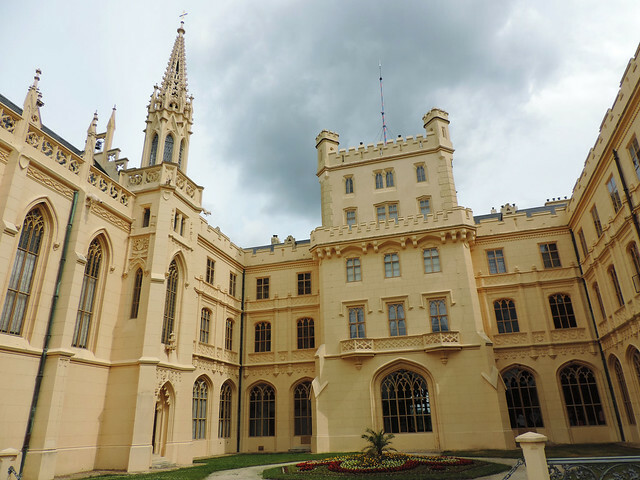 Like Lednice – this fascinating Neo-Gothic palace that served as a summer cottage. Yeah, no need to be sorry for Eastern European nobility. The most fairy talish castle of Eastern Europe? 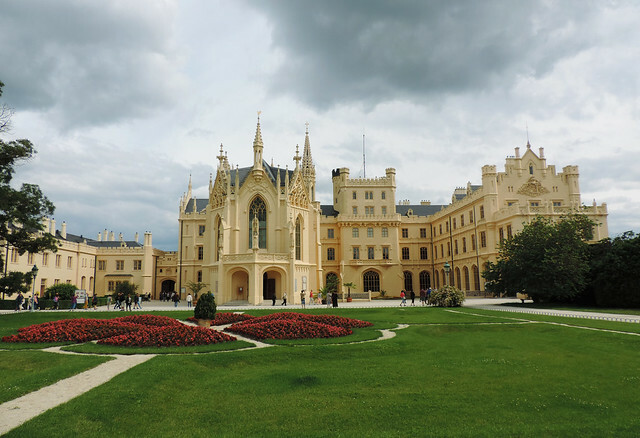 Lednice Castle is located in the Southern part of Moravia, one of the three historical regions of the Czech Republic. 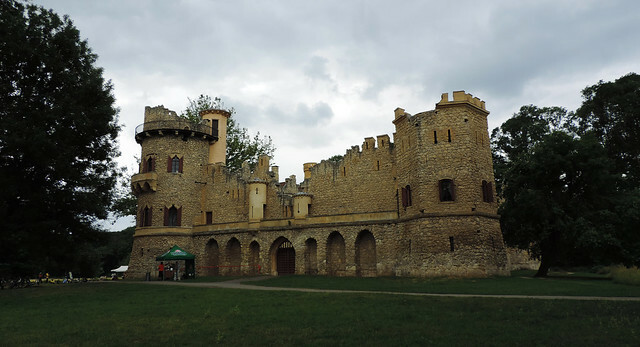 And it’s the most fairy talish castle we’ve seen in Eastern Europe so far – though we are trying hard to confute this. Hell, we want to find more places like Lednice! 😀 It amazed us both from inside and outside. 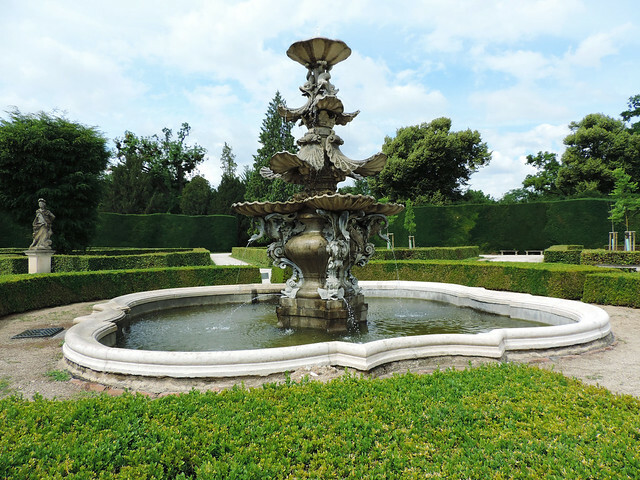 Not to mention, its formal garden matches perfectly with its fairy tale style. First thing we did once we arrived was buying our tickets for the upcoming guided tours of the interior. Okay, I’m lying here, the first thing was actually taking pictures because how could we stand not to? 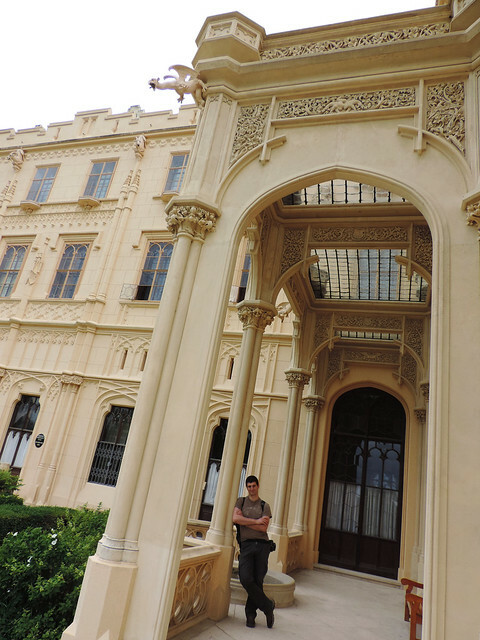 Then we got our tickets for the Princely Apartments on the first floor. Guided tours start quite frequently and we barely walked a bit around the castle when it was already tour time. The tour was in Czech but we got textbooks in English. Still we were sorry that we didn’t understand the guide because he seemed entertaining. We did enjoy the tour though because the rooms were really beautiful. Fine furniture and glasswork, elegant chandeliers, hidden doors and huge portraits on the walls, lovely colors and motives in the Chinese cabinet. It ended too soon. So did the next one: the tour through the Representative Rooms on the ground floor that was the real highlight! There is a separate ticket for that tour and it was also in Czech (and we had our textbooks). Every single room of the ground floor was stunning but our favorites were the library and the following rooms: the Turquoise Room, the Red Room and the ballroom. The vibrant colors along with the impressive woodwork – especially the carved woodwork of the ceilings – took our breath away. Another majestic piece of woodwork was the staircase in the library that is carved from a single piece of wood. By the time we finished the two guided tours it was already past 2 pm. We had a romantic walk in the formal gardens. Flowers planted in different colors to form different shapes. Some charming fountains. 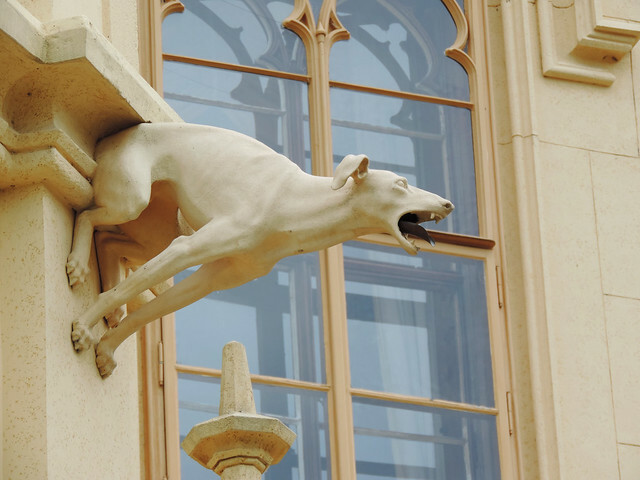 Gargoyles in shape of monsters, dragons and dogs. 3 pm. We didn’t really care about time. And it was for good because there was a huge castle park still to be explored. 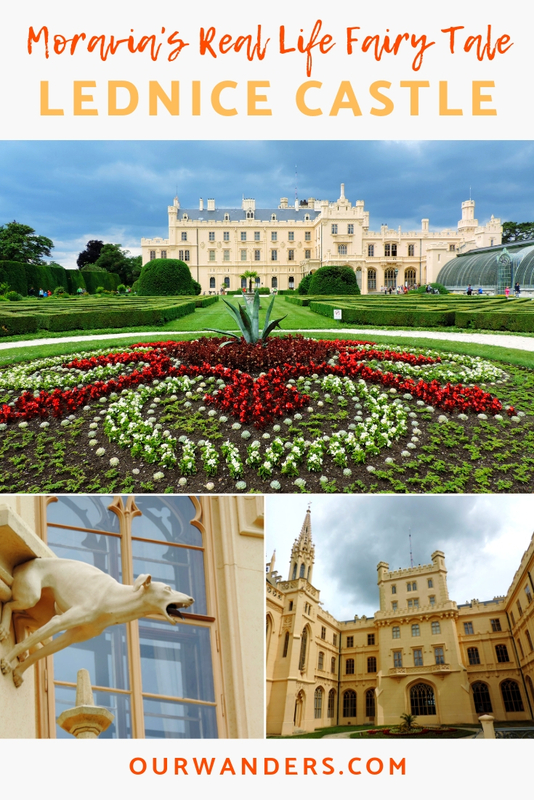 Lednice and the whole landscape around it is a UNESCO World Heritage Site thanks to the wonderful harmony of nature and human structures. The park around the castle is enormous! It has wide meadows, old trees and a river flowing through it. There’s a minaret reflecting in the river and it was built for exactly that reason: being a candy for your eyes. But the artificial ruin of the minaret is not the only one of its kind in the park. At the turn of the 18th and 19th century Romanticism was really a thing and everyone longed for their own “romantic ruins”. Some of them could afford building them. That’s the story of Janohrad (Johnś castle), the castle ruin in the park of Lednice Castle, too. But it was more than mere decoration. 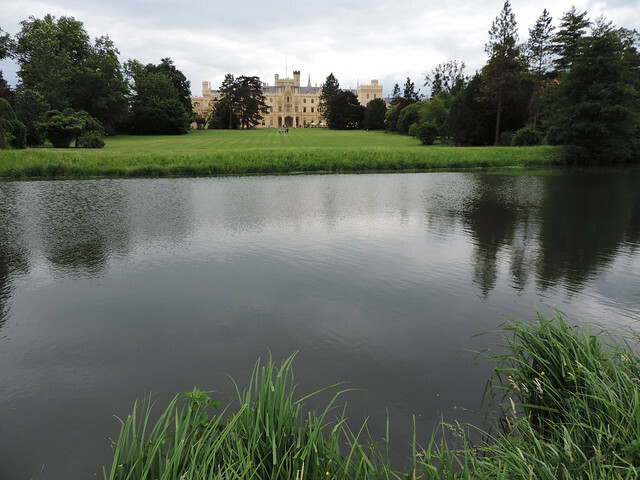 It served as a hunting lodge and it was a popular place for marriage proposals (who would have thought? 😛 ). 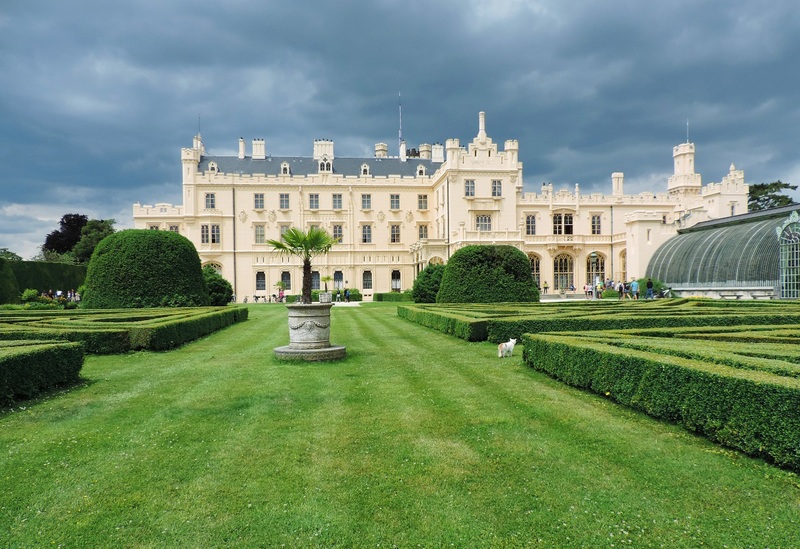 Lednice Castle was originally built in the 13th century and it was the property of the Liechtensteins, one of the wealthiest families in Moravia. But it didn’t start its career as the romantic chateau we know today. It was an old medieval castle that was replaced with a Renaissance chateau in the 16th century. Sure, it was a nice change. But then it was torn down again in the 17th century to be replaced with a Baroque palace. And it doesn’t look like Baroque at all today. Well, it was rebuilt once more in the 19th century in Neo-Gothic style and that’s what we can see today. During the Second World War and then the communistic nationalization that followed the original equipment of the castle suffered greatly. Still, there’s enough left behind to amaze curious visitors. 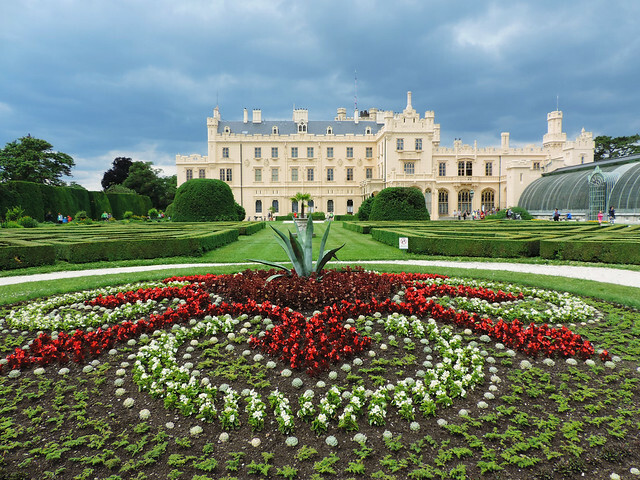 The garden of Lednice castle is open to the public and free to visit during the opening hours that vary throughout the year. You can check it on the official homepage of the castle along with the different guided tours that give access to the interior. Visiting as individuals there’s no need to book these tours in advance. You show up at the ticket office and get your tickets for the next available tour (most probably starting within an hour). Tour times are quite frequent but all the guided tours are in Czech. We got English textbooks and textbooks are available in several different languages. So… are you tempted for a visit? Do you have a favorite castle?